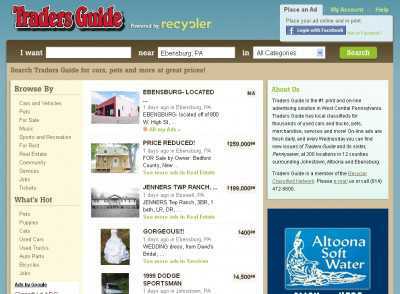 For people who live in West Central Pennsylvania, TradersGuide.com is where they can post and read classifieds for free. The site features local classifieds for everything from cars, merchandise and services to pets and Real Estate, and the ads you can see on its homepage are refreshed every day. And there’s also a print version of Traders Guide that goes on sale every Wednesday, along with a sister publication named Pennysaver. 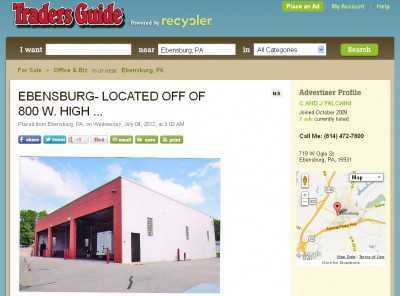 You can buy these mags in more 12 counties including Altoona, Ebensburg and Johnstown. All in all, issues of Traders Guide and Pennysaver are available in more than 300 different retail locations. But coming back to the website, you can browse it both by category and by keyword. And if you just want to see if you can quickly spot a bargain or two, then you can check the “What’s Hot” section at the bottom of the homepage, and see which notable items can be bought within each category. And the newest ads to have been posted are highlighted on the homepage, too. It is very easy to place an ad. You can sign up for an account by entering your email address, and picking both a nickname and a password, or you can log in with your Facebook identity. 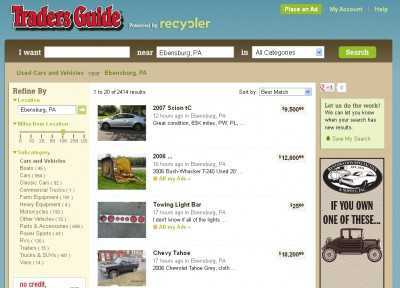 And if you are a Recycler.com user (Traders Guide is currently powered by that company) then you can use that to sign in instead. An ad can be created just by supplying a description of the item you want to sell, uploading some photos and setting down its price. Once you have submitted all that information, your ad will go live for all to see and (hopefully) act upon.